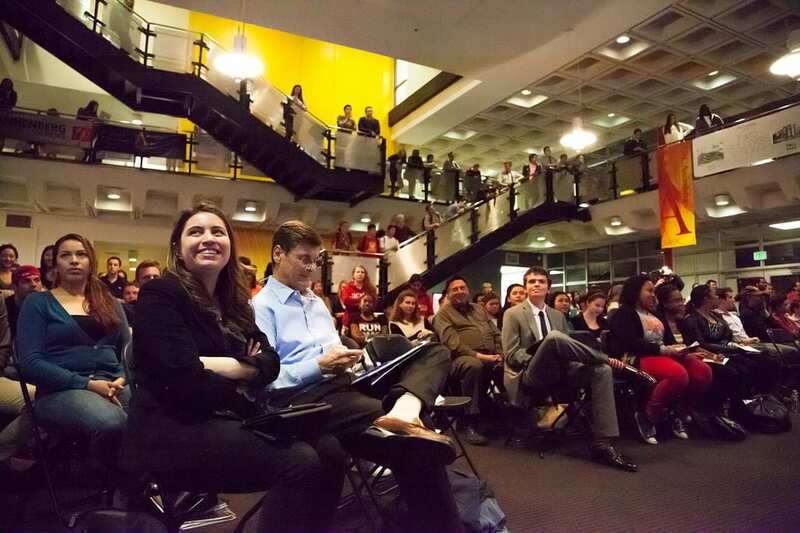 Over 100 students attended the State of the Union watch party hosted by the USC Annenberg Center on Communication Leadership and Policy (CCLP) and the USC Unruh Institute of Politics. See more State of the Union photos on Flickr. KTLA and Telemundo covered the event alongside student representatives from Daily Trojan, Neon Tommy, and Annenberg Television News. After President Obama’s speech, we had a discussion and Q&A session with Dan Schnur, CCLP senior fellow and USC Unruh Institute Director (on leave); Bill Simon, co-founder and co-chairman of William E. Simon & Sons, LLC; Sarah Herald, USC College Democrats president; and Jack Merritt, USC College Republicans speakers’ director. The panel was moderated by Kerstyn Olson, interim director of the USC Jesse M. Unruh Institute of Politics, and Jonathan Wilcox, a former gubernatorial speechwriter and president of Multiplicity Media.